The shrill sound of the alarm pierced the still, dark night. The prisoners lay frozen, praying they would not be part of those chosen to be executed. According to the barbaric law of the camp, when an inmate escaped, ten men from his cell were chosen to starve to death, in the underground bunker. They rounded up all the prisoners and had them stand at attention, for three hours, in the prison yard. Then, they marched them in to have their meager supper, all that is but the men of block 14! Instead, they were forced to helplessly look by, as their rations were dumped into the canal. The next day, they were lined up in the scorching sun, as the rest of the prisoners went off to work. They were given nothing to drink or eat. Their condition became so unbearable, many of them collapsed and not even the guards’ brutal beatings could arouse them. They just dumped them, one on top of another, in a heap. As night approached, the rest of the prisoners came back. They, too, were lined up, facing those of block 14, so they could witness what happens when someone escapes. They stood there, helpless to ease the fear they saw in their fellow inmates eyes, as they stared across at them…And then, the dreaded announcement: “Since the fugitive has not been found, ten of you are condemned to death.” The commander Fritsch took delight as he passed back and forth, before the prisoners of block 14. He could read their minds, Oh God, don’t let it be me. “Good-by, friends; we will meet again where there is justice,” was joined by another sobbing, “Long live Poland!” “Good-by! Good-by, my dear wife; good-by, my dear children, already orphans of your father,” cried out Sergeant Francis Gajowniczek. A prisoner from block 14 stepped out of the lineup. It was Father Maxmilian! He had been assigned to block 14, had endured all the torture and was still standing. He walked slowly and calmly toward the commandant. He stopped in front of Fritsch. The sight was blinding! There was a hush that went through the men lined up. No one, in the history of the camp, had ever done anything like this before. They stared; they tried to take their eyes away, but they couldn’t or wouldn’t. Suddenly they were not afraid of this man who reduced men to animals; he no longer posed a threat. The man before him, chest caved in, little more than hanging flesh on thin bones, had the upper hand. The commander was stunned, frozen. Was he afraid at what or who it was, he saw? Did he remember from a thousand lifetimes ago, his mother telling him about the Savior who gave His life for him? Here was a man who had traded his God in for a lie and he looked frightened. Facing him, was one who death could have no victory over, one who dared to love Him with all his heart, mind and soul, totally abandoning himself to Him. He had loved others through Him, in Him, with Him, even this monster in front of him. This one who so exemplified the Sacrificial Lamb who died, forgiving them, saying “They know not what they do,” frightened him! Father Maxmilian was 47 years old! 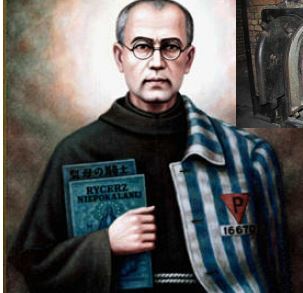 On May the 28th, 1941, Father Maxmilian, although suffering seriously from tuberculosis, was transported along with 320 other prisoners, to Auschwitz. He was treated no better because he was a Religious. Rather, they were harsher on the Religious, taking some kind of delight, determining how much torture they could take before cracking. Father Maxmilian was given a number, 16670; he was assigned to block 17. The guards pushed, kicked and beat Father when he was too ill to walk. He struggled, as he tried to haul the wheel barrels full of gravel, they needed to build the crematorium walls. Oh, they were not past using prisoners to build their own means of torture or death. No matter how they brutalized him, how they tried to humiliate him, the could not force Father into hating them. He had so much love in his eyes, they made him lower his eyes so they wouldn’t have to look into them. 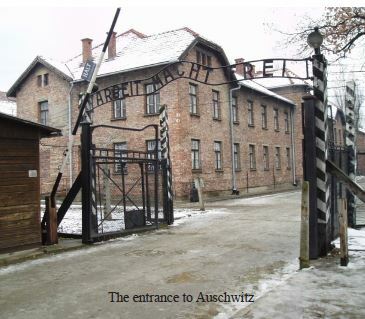 Auschwitz or the Death Camp, as it was more commonly called, was originally to be for the extermination of Jews. Then, the Third Reich added to their Martyred number: the Danish, French, Greek, Spanish, Flemish, Yugoslavian, German, Norwegian, Russian, Rumanian, Hungarian, Italian and Polish undesirables, whose only crime was they were leaders or intellectuals. Although its horror was not singularly its own, it had the reputation of being the most efficient of all the concentration camps, building up to a record of exterminating 3500 enemies of the state in 24 hours. They became so good at their job, the sign above the entrance gate reading “Work makes one free,” they were capable of killing prisoners on arrival. Many they did; others they saved for slave labor; others they had fun with; their action: to degrade, to see how low they could make a human stoop with enough torture. I think, the saddest testimony I ever heard was from a survivor of the concentration camps. He told how parents would have their children go before them, into the showers (the Nazis jokingly called the gas chambers), so they would not be frightened, the parents reassuring them, it was all right, they would be following. He infuriated the Nazis as he worked to keep the Poles and the European Jews from being reduced into groveling animals, turning on each other. To punish him, the guards would save the most demeaning work for him. At one time, they even set their vicious dogs on him. They used Father to carry corpses to the crematorium. A former prisoner testified: one time, when he (the prisoner) was asked to carry a young man’s horribly ravaged body, his ripped open stomach, evidence of just part of the torture he’d suffered before dying, he was so repulsed by the sight, he did not have the strength or the stomach to lift him. Then he heard a gentle voice, hardly above a whisper: “Let us take him.” As they carried the young man to the crematorium, he could hear the prisoner helping him, “Holy Mary, pray for us.” Father Maxmilian was calling to his Mother, and as She did with Her Son Jesus as He carried His Cross, Her eyes sustained him. But soon, they beat his weary, broken body to such a point of breaking, he landed, more dead than alive, in a hospital. His tuberculosis got so bad, he was, again, like Jesus before him, dying of asphyxiation, unable to breath. They determined he had pneumonia. His face had begun to show the scars of his mistreatment, and his voice, betrayed by the dryness from too much heat and too little water, was robbing him of his speech. But yet, a fellow Priest testified, he was an inspiration to everyone. He was never too weary, too tired, too broken, too sick to hear confessions. He was happy to be in the hospital because so many there needed a Priest. One of the prisoners had somehow gained the trust of the guards and they would let him out. He would return, hiding food under his clothes, which he shared with the other prisoners. One day, he sneaked in some hosts. Now, it was immediate execution, if a Priest was caught celebrating Holy Mass. Even those men, who had become monsters, knew the Power of Jesus. Father took the hosts, said the words of consecration and he brought Jesus in the Holy Eucharist, the Bread of Life, to his fellow patients. He celebrated Holy Mass not once but twice. At times, he took what little bread he had and consecrated it, distributing the Lord to all. But, he never would accept any of the other prisoners rations, saying “You need them. You must live.” Father Maxmilian, Priest! When he left the hospital, he was assigned to Cell Block 14. A prisoner escaped! The shrill sound of the alarm pierced the still, dark night. The prisoners lay frozen, praying they would not be part of those chosen to be executed. According to the barbaric law of the camp, when one inmate escaped, ten men from his cell were chosen to starve to death, in the underground bunker. They rounded up all the prisoners and had them stand at attention, for three hours, in the prison yard. Then, they marched them in to have their meager supper, all that is but the men of block 14! Instead, they were forced to helplessly look by, as their rations were dumped into the canal. could witness what happens when someone escapes. They stood there, helpless to ease the fear they saw in their fellow inmates eyes, as they stared across at them. And then, the dreaded announcement: “Since the fugitive has not been found, ten of you are condemned to death.” Commander Fritsch took delight as he passed back and forth, before the prisoners of block 14. He could see the fear in their eyes; he could read their minds, Oh God, don’t let it be me. A prisoner from block 14 stepped out of the lineup. It was Father Maxmilian! He had been assigned to block 14, had endured all the torture and was still standing. He walked slowly and calmly toward the commandant. He stopped in front of Fritsch. The sight was blinding! There was a hush that went through the men lined up. No one, in the history of the camp, had ever done anything like this before. Here was a man who had traded his God in for a lie and he looked frightened. Facing him, was one who death could have no victory over, one who dared to love Him with all his heart, mind and soul, totally abandoning himself to Him. He had loved others through Him, in Him, with Him, even this monster in front of him. This one who so exemplified the Sacrificial Lamb who died, forgiving them, saying “They know not what they do”, frightened him! The underground bunker, block 11, was a chamber of horror. It was closed in by a wall twenty-one feet high; prisoners were to have no communication from the outside. Upon entering, inmates knew they would only leave as corpses, on their way to the crematorium. Only a few Poles came in any kind of contact with the bunker, those who the Nazis needed, to carry out bodies and etc. This is how we have any idea of what went on. They led Father and the other nine to bunker 11. They stripped them of all their clothing and left them, sneering, “We will dry you up like tulips!” A Pole later testified: when they went down to the bunkers, it sounded as if the Angels were accompanying the prisoners singing hymns to Jesus and Mary; instead of curses, the Rosary and Litanies of prayers resounded through the dungeons, petitioning God for mercy in what He would give them and thanking Him for what He had given them. The other bunkers, having joined the little Priest in bunker 11 were heard echoing his love song to Mary and Her Son Jesus. They were so immersed in their praise and worship, they often did not hear the guards until they shouted at them to be quiet! When the door opened, the prisoners pitifully begged for some water and bread. Those who were strong enough to make it over to the door were kicked in the stomach, and when they fell, if they did not die, they were shot right there. Conditions got so bad, the prisoners drank their own urine (as was evidenced by the empty and dry pails that had been left for them to relieve themselves). Father encouraged the other innocent prisoners not to give up hope, to pray that the escaped prisoner would be found and they would be freed. For himself, he asked nothing. He even got to the guards, who came in each day to check up on the prisoners. They had never experienced such love and compassion. For some, it was more than they could handle; was he showing them what man could be like, according to God’s plan? They called him a real gentleman. Father Maxmilian lived longer than the rest, consoling them and praying with them until they mercifully gave up their last breath. Two weeks passed; prisoners died one after the other. At the end of the third week, there were four left; Father Maxmilian was one of them! So, needing the bunker for more prisoners, they called in the director of the hall of the sick, the infamous and wicked Boch. 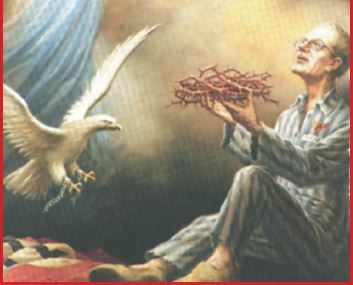 He lifted the arms of the prisoners left. As they looked up at him, helplessly, he injected them with poisonous acid. Father Maxmilian died on the vigil of the Feast of the Assumption of our and his Lady into Heaven. What the world, with the world’s eyes, saw was an emaciated body brutally tortured, wasted away, desecrated by his forced nakedness – more bones than flesh. But witnesses testified when they saw him, he was shrouded in a flood of light, almost transfigured. He looked as if he were in ecstasy. Had Jesus and Mary come to accompany him home? It was Friday, August the 15th; men came for his body and placed it in a box. It was taken to the ovens.